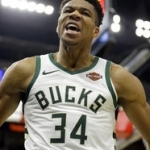 Giannis Antetokounmpo scored 29 points and had 17 rebounds, Eric Bledsoe added 19 points and the Milwaukee Bucks outlasted the Chicago Bulls 112-99. Malcolm Brogdon added 17 points and Khris Middleton had 16 to help league-leading Milwaukee win for the seventh time in eight games and improve to 13-2 over its last 15. Antetokounmpo recorded his 39th double-double of the season after sitting out his fourth game of the season Saturday. The Bucks continue to maintain a one-game lead over Toronto for the top seed in the NBA’s Eastern Conference.